1. Malachite reveals the truth about oneself and brings to the surface that which is unknown or unseen to the conscious mind. Some practitioners have used Malachite in meditations to get in touch with the Earth Mother. 2. 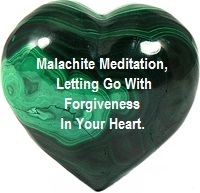 Meditating with Malachite shows you where dis-harmonies are within your mind, body and soul. Our bodies can tell us what we need, what we are missing and what is required to do to correct the problem, but often it is hard to be able to listen to what our bodies are saying. 3. Meditating with Malachite helps strengthen the immune system. 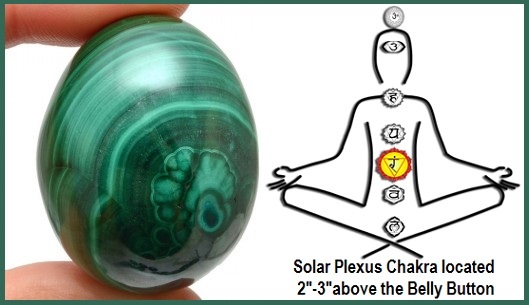 While meditating, hold a Malachite crystal in each hand and allow the energies to flush through your body. Visualize the energy sweeping through your blood stream cleaning out all the little germs and viruses that make us sick. It is important when Meditating with Malachite to always work with polished stones. 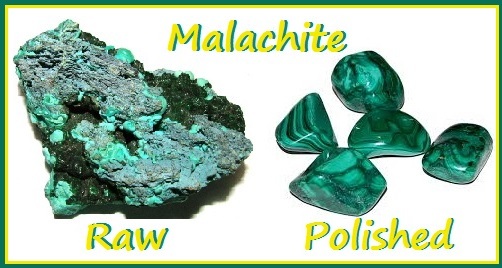 Malachite is toxic in raw form and one must avoid breathing its dust. 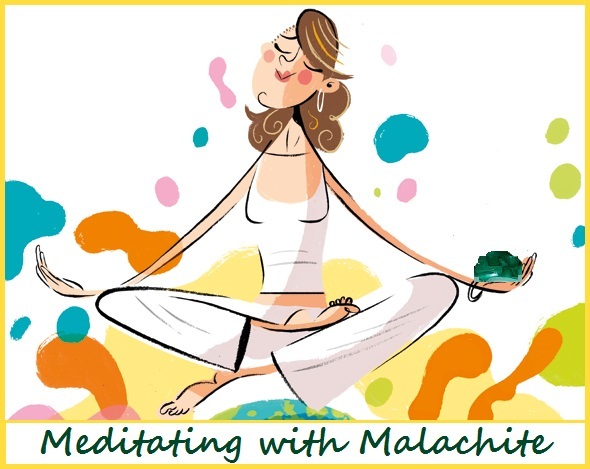 Judy Hall gives us the following Malachite Meditation in her book, Life-Changing Crystals. This meditation is a potent way to connect with the issues that are keeping you from stepping into your power. It helps resolve past issues and energetic blocks. Malachite’s strong protective properties and wisdom make you feel safe as you gently let go of old thoughts, feelings and experiences that no longer serve you. 1. Find a quiet place, and breathe gently, bring your attention into the crystal. Keep your eyes half-open and gaze at the whorls and contours of your Malachite as you connect with the crystal’s power. Feel its strength in your hand. Let the energy radiate up your arms and into your heart and mind. As you focus on each whorl, let it take you inward. Allow the bands to move you gently into contact with your deepest self. Close your eyes and relax. 2. When you are ready, place the crystal over your solar plexus. Ask the crystal to let you know what you are holding onto, and what would be beneficial to release. Acknowledge any emotions that arise, and lovingly release them. Take your mind around your body to any areas of tension or pain, breathe gently and let them go. Let the Malachite show you any hooks that are in your heart and gently dissolve them, filling their place with forgiveness and loving energy. 3. Let them go, with forgiveness in your heart. Ask the Malachite to show you how the past is affecting your present, and how your mind and your emotions control what you manifest. Willingly surrender all that no longer serves you – all the pain, emotions, beliefs, and expectations that have weighed you down and held you back. Acknowledge them and let them go, with forgiveness in your heart. 4. Step into your power. Ask the crystal to show you the gifts hidden behind the old pain, the qualities you have developed and the resources you can draw on. Allow yourself to know how you will use them, and how you will work with Malachite in the future to manifest your new reality. If there is any other information from Malachite, wait quietly for the answer. If an inner figure appears, negotiate a positive role for it. 5. 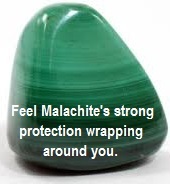 Feel the strong protection from the Malachite wrapping around you. Before you begin the return journey, bring your attention to the subtle bodies around your physical self, and ask the Malachite to draw off and transmute any negative energies or disharmonies that have not been released. Finally, feel the strength of the crystal and its powerful connection to the Earth, grounding you into your physical existence, bringing you fully into the present moment. When you feel ready, thank the Malachite, open your eyes, get up and move around. AuthorJudyHall, BookLife-ChangingCrystals, GetInTouchWithEarthMother, MalachiteMeditation, MeditatingWithMalachite, RevealsTheTruthAboutOneself, ShowsDis-harmonies, StrengthensImmuneSystem, WhatAmIHoldingOnTo?